65W x 2 into 8 ohms, 6 inputs including a MM phono input and tape loop, preamp output. -Detailed highs -Precise imaging, but at the time I had a Myryad Cameo integrated and it had slightly better sharper Imaging. -Sound stage is 3-D as it should be. -Transients were handled nicely. -Low end is not bloated, but lean... Sounds very neutral.. But I had an Atoll IN50 which was much superior with mids? I had 3 amps when I had this - Atoll IN50 which had better mids , and Myryad Cameo(z142 itself in a diff shell) which had better everything, but only lacked the mid forwardness of the Atoll, Arcam had better bass than the Atoll. Atoll lacked extension, so it becomes a choice about whats ones liking at this price. Also the Atoll's sound stage was not as 3D as the Arcam. I liked Myryad as it was better all rounder. Not efficient for its transformer power rating. My Myryad Cameo integrated killed it! Arcam A80, got this yesterday 2nd hand, 3years old from first owner. I hooked it to my Arcam Alpha 8se cdp, Pre out to Quad 405-2 Power amp for LF and Speaker 1 output to HF of my B&W DM 603 with QED Qunex 1 interconnects and QED Silver Anniversary speaker cable. The result? Its Sweet,warm, live and very involving sound.The detail is excellent where you can hear all the instruments being played at the right place and at the right time. The sound is natural and the blending of instruments and vocals are smooth. I dont agree with some reviewers that it lacks slam or power. This amp just deliver the sound without exaggeration, it just deliver the right sound that it should be. Its not bright, its BALANCE. Maybe with other reviewers, their other system did not match with A80. My B&W DM 603 tweeter was a bit bright with QED silver anniversary cables (which is bright as well) but I opted to use the speaker output 1 of the A80 to HF at 65 w/rms (Lower than the LF at 100 w/rms) and the Pre out to Quad power amp to drive the LF at 100 w/rms and it matches sonically. The HF/tweeter was tamed and became sweet. My advice is dont pair the Arcam with bright speakers, interconnects and speaker cables. Avoid speakers with metal dome tweeters, use instead silk or other fabric based tweeter drivers to sound smooth. With regards to bass, its just enough. Its not muddy and dominating. Its just there when its needed according to music naturally. Remember that there is no best sounding amplifier in the world, its a matter of taste of the listener and each amplifier has its own unique characteristic. Some has a strong bass and weak highs and some has tight and hard bass and some has soft but they had created that according to their philosophy and if it matches to your own taste then alas, you'll gonna enjoy it. The best thing to do before buying your system is to Audition and decide according to your taste.. Use the reviews as reference only but dont use the reviews to decide buying your gears. With me, i'm so happy with the sound of Arcam A80. It justified the money i've spent on it. I have loads of gears at home with each room has different system. Having listened to different systems, I realized that every maker has its own brand of sound. There's no such bad sounded amplifier except those some mass market products. Just gracefully gets on with the job it was designed to do. Runs very cool, smart. Sounds good too! I have owned the A80 for over 3 problem free years now, running with a Marantz CD6000KI, Rega P3 and AE1 series 2 speakers. I think it's unfair to say the sound is biased towards treble, I would say it's a very smooth neutral sound, with lots of detail and surprising depth considering it's modest rated output power. I agree that perhaps it is not the loudest amp in the world, but it is certainly more than adequate in an ordinary domestic environment. My personal opinion is that the amp does not impose much of it's own character to the music at all. I would would imagine any problems with treble skew could be down to partnering equipment and / or interconnects. Granted some amps go louder and perhaps give more bass, i've tried several and usually find that after half an hour I get a headache. I like the Arcam because you can listen for hours without it becoming a chore. No problems encountered, but my dealer is excellent!! Marantz PM7200KI, Arcam Delta 290/290P, Quad 34/405-2, Musical Fidelity A5, Quad 99/909. great sound well built and no flashing lights!! I started with a AVR amp but grew tired of the artifical sound and all the flashing lights..orginally I had a Pioneer hooked up to B&W 601s2 I up gradedto Harmonkardon avr2550 but when I put my new B&W 705's inot this I found that it didn't have the grunt. I decided to go back to 2ch stereo simply because I rarely watch movies and to get quality thousands need to be sent. After all 5 or more amps to be any good costa lot of hard earned cash! I listened to several amps ...but I loved the sound the Arcam A80 produced when hooked up to my 705's( I run a B&W 700 sub) . It is such a musical sound.. and is able to drive my B&W's with ease.. plenty loud enough for my ears as well... all in all a great sounding amp with plenty of drive and clarity. THis amp would suite a discering listener.. who requires power and style.. Crisp, clear and clinical sound. Low frequency representation is good. Very shrill, tinny and over emphasises trebble. Completely lacking warmth and depth. Any vocal higher than tenor sounds screechy. I wish I had got my Technics repaired instead. I bought the Arcam A80 to replace my 20 year old Technics SUV550 whose switches are oxidising. It is neat looking and easy to operate and has a comprehensive remote control. Good definition of instruments, particularly in classical orchestra. More than adequate volume for domestic use. Absence of tone controls would not matter were it not for the factory setting skewed towards trebble. Surprised there is no 'loudness' switch for low volume playing, no selector for MM and MC phono cartidges and no digital or optical input from a CD player. Recently purchased this nice amplifier (from an Arcam authorized dealer). In a nutshell, this unit has crystal clean sound, smooth & slightly bright (not warm but smooth sounding). I must say this, the output is rather low with minimal gain (even with the input trims offered with Arcam amplifiers, what’s the point!?). Certain CD’s truly don’t play loud enough. And LP’s, forget about it, the gain is even lower. But, without the volume issue (with certain material), the amplifier sounds very very nice! I also purchased the CD 72 CD player. Now, that unit has been TEMPERMENTAL to say the least! Sometimes the CD player won’t read any disks at all! Then I have to power it off & on, then it works? (this is from day 1 of owning the unit!!). Also, it sometimes skips. What’s troublesome is that I voiced my amplifier concerns and CD player concerns over the phone with the retailer (I live 2 hours away from the retailer) who’s only advice was to change my audio cables and asked me if I wanted to have the CD player shipped for service. Hell no! I wanted a new CD player!!!! I must ask, is there any wonder that most consumers purchase mainstream products, that in recent years, have improved substantially in regards to sound & technical specs, and have no problems with doing exchanges or returns for other products from their retailer? This combo has very nice sound but I’d expect more in customer service from a company that does so much advertising in consumer magazines (here in the US and in Europe) as well as form an authorized dealer. The CD player should have been exchanged “No Questions Asked” and I should have been offered an exchange for another amplifier (If I had chose). Buyer Beware! LACK of Power! Lack of tone controls. Similar to the other reviewer here, I was looking to go away from a newer home theater setup in order get back into a 2 channel system, since I listened to my home theater for 2 channel sources mostly anyway. I’ve been into music (and equipment) for many many years and have owned mid range systems ranging from old Fisher tube gear to the latest in Denon home theater receivers (analog, digtal sources). Logically thinking, a power supply made for a 2 channel integrated would operate better than a single power would for a multi channel set up, right? Well, unfortunately NO! :( At “low” listening levels (and specifically for Jazz vocals) the Arcam A80 partnered with the CD73 sounds wonderful, HOWEVER, for rock music I find that the high level cut off of the CD player to be disappointing and rather enjoying. So much so that I began experimenting with different interconnects and so forth. Bottom line and sadly, other than at low volumes where the bass, and mid bass frequencies excel, my 5 year old Denon receiver out peformes my new combo substantially. Not only does it play ridiculously louder! But, it also doesn’t distort where the Arcam loses its grip at about 90% of the volume. I find the high level cut off especially annoying when listening to rock (cymbal crown hits, tambourine, etc.) and unfortunately find myself listening to the flaws in the equipment instead of the music :( The absence of tone controls doesn't help either. 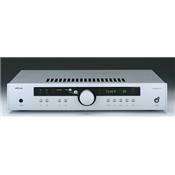 Arcam has tone controls in their other 2 integrated amps in this series, as well as in their all in one Solo system. Why they didn’t include it in the A80 was a mistake as far as I’m concerned. As for now, I plan on returning both the A80 integrated as well as the CD73. For Jazz or soft pop it’s a nice detailed combo, but for loud music, especially rock, I find it weak. So weak that I suprisidlly prefer the sonics (that’s clean detailed power & drive) of my home theater setup for 2 channel sources. Hopefully, my place of purchase will refund me the monies paid for the combo that I truly can’t seem to justify the expense..